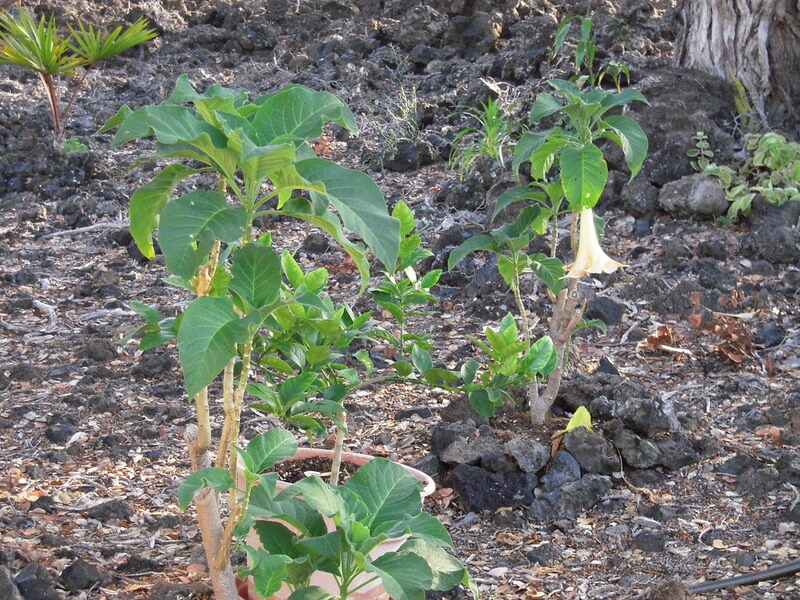 Some of the first cuttings I received in early 2006 were the “Angel Trumpet” from my friends in Na`alehu, or what is more properly known as Brugmansia. 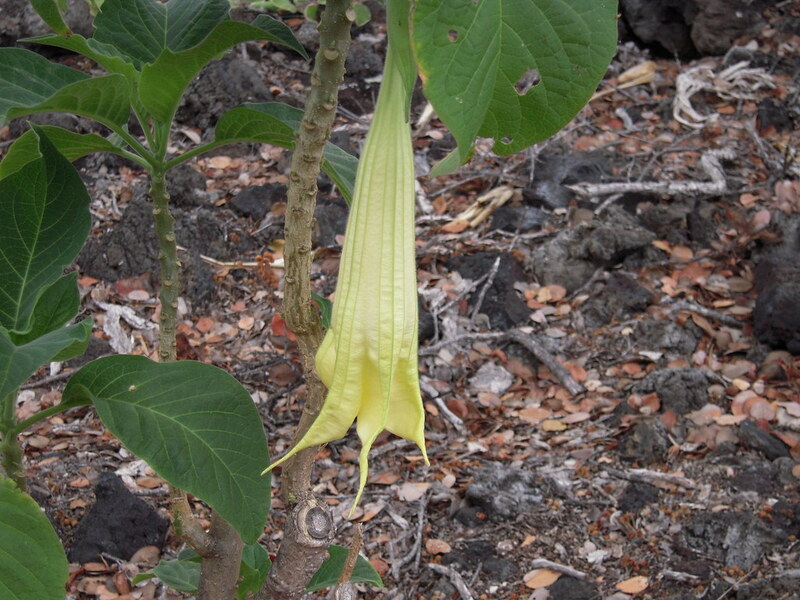 At first, I called it Datura, and I discovered that I’m not the only one to confuse it with Brugmansia. “Dave’s Garden” is a website I go to often for questions I have about certain plants. This link gives a thorough description of the differences. 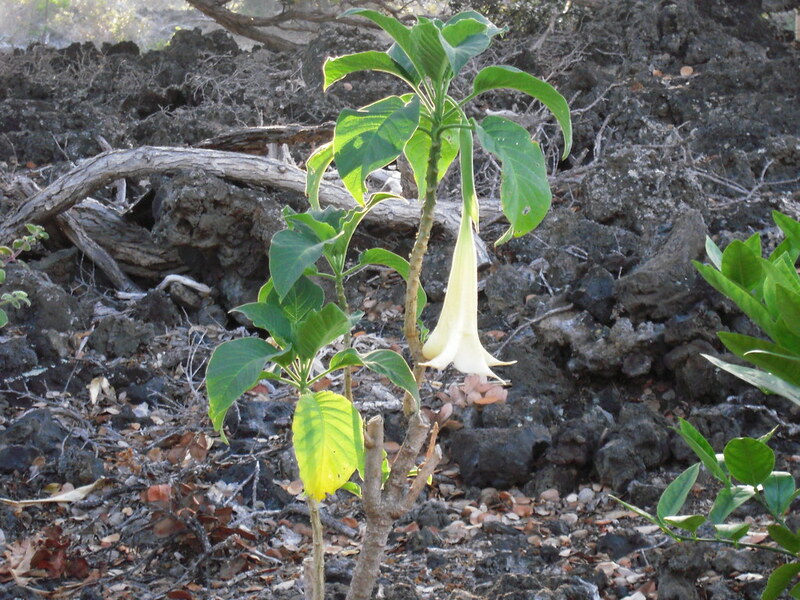 One of the most noticeable is that the Brugmansia has long pendulous blooms, while the Datura has a more upright trumpet. 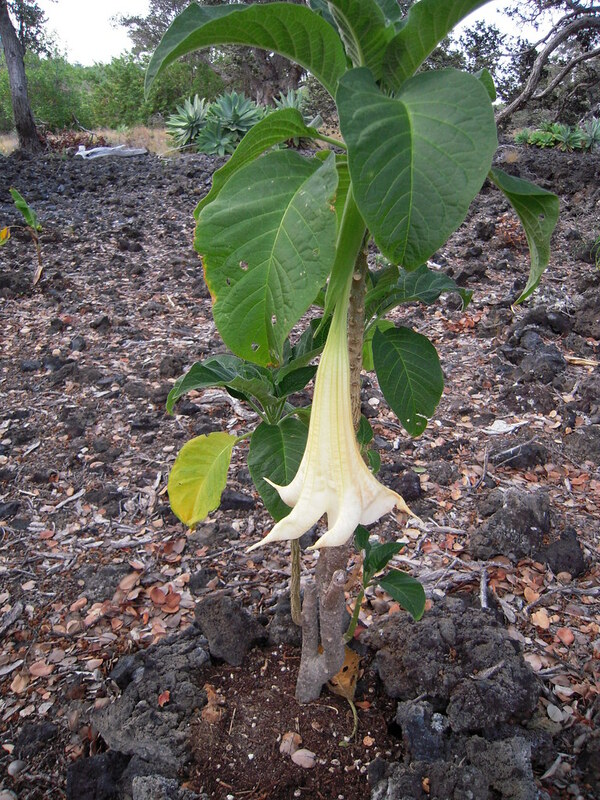 Also, the Brugmansia can become tree-sized and the Datura doesn’t grow taller than about four feet. 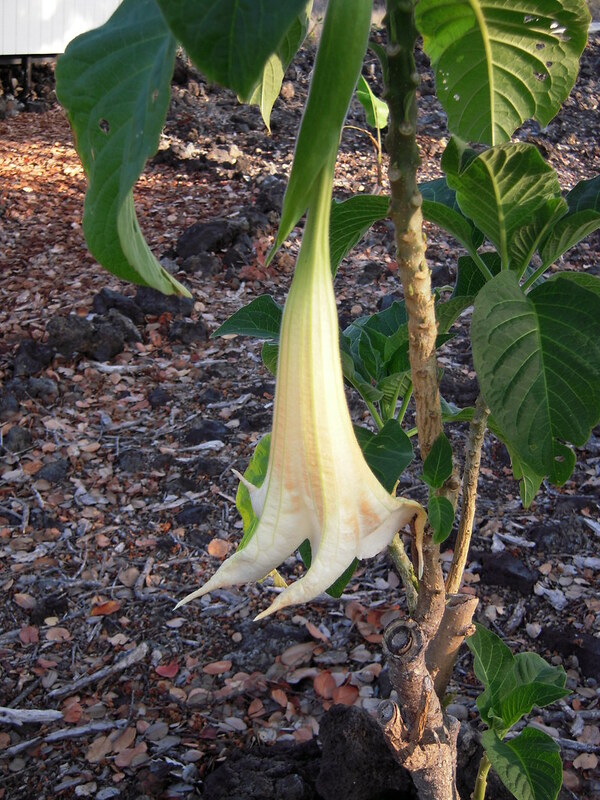 So the beautiful trees with the cream or peach colored blooms hanging down and swaying in the breeze all over the island right now is actually a Brugmansia, as far as I can tell from my research. At any rate, Brugmansia is what I was given over three years ago, and they rooted quickly. Here is a picture taken toward my driveway from the house and you can see several of them, easily distinguished from the palms and plumeria. 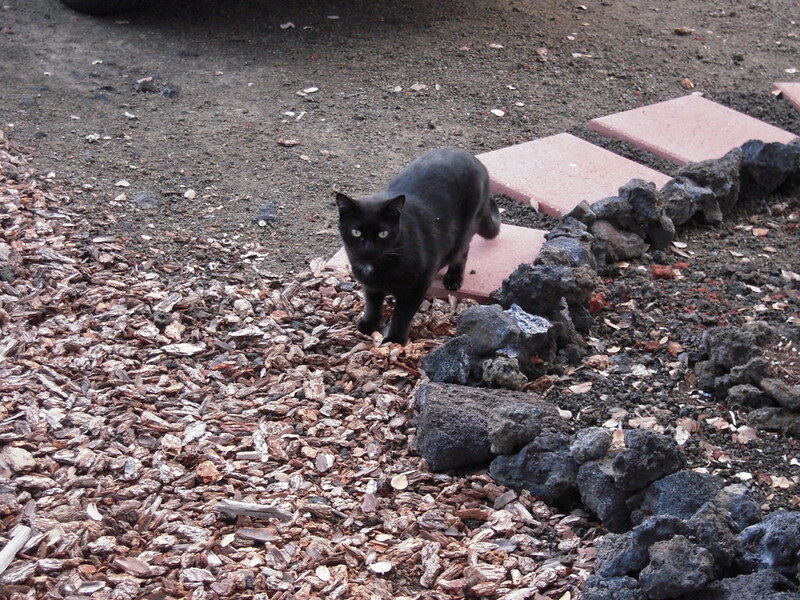 This was taken when they were one year old (April, 2007). These two trees are nearer my front door, taken at the same time (April, 2007). I have nursed all of these, watered regularly, put plenty of soil around them, and bestowed them with lots of TLC. Just this week, I had my first bloom, and it wasn’t even on the biggest of the plants I have. In fact, it was in the smaller of the two trees in the above photo. During my regular watering last Saturday (April 18), I noticed this long green bud hanging down from the center of the plant. Normally, I examine each plant carefully and talk to it as I water to check for bugs, disease, and growth, but this bud had escaped me. It seemed like it must have come out overnight. I took pictures as it unfolded. You would think it was my new baby – and in a way, I guess that’s absolutely true. Those who have several full-grown trees in their yard, must think I’m crazy, but after struggling to get even one bloom, I’m ecstatic with what I have. Three days later (April 21) it had started to open. By Thursday (April 23) it was fully open. 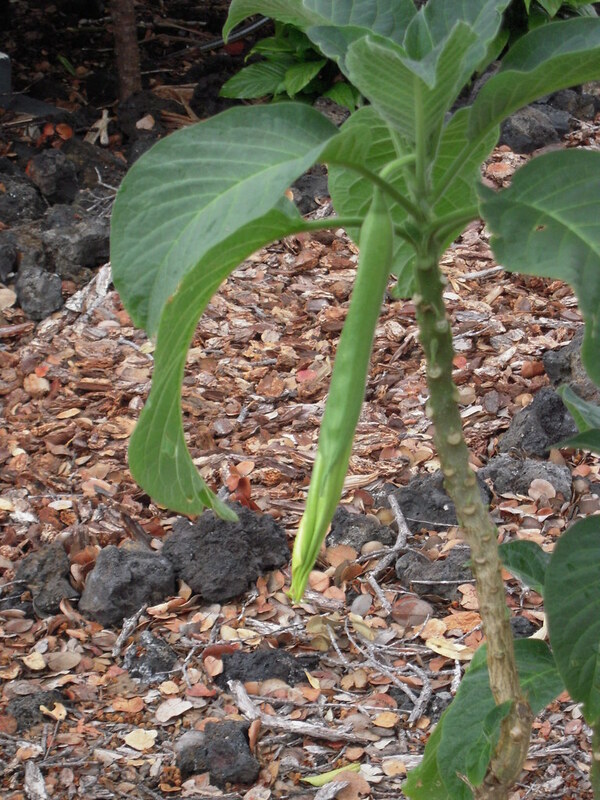 I hope that this means I’ll be seeing more blooms on my other Brugmansia plants soon. 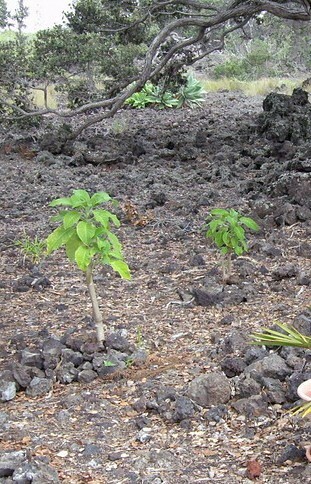 There are some other features about this plant that you should know. 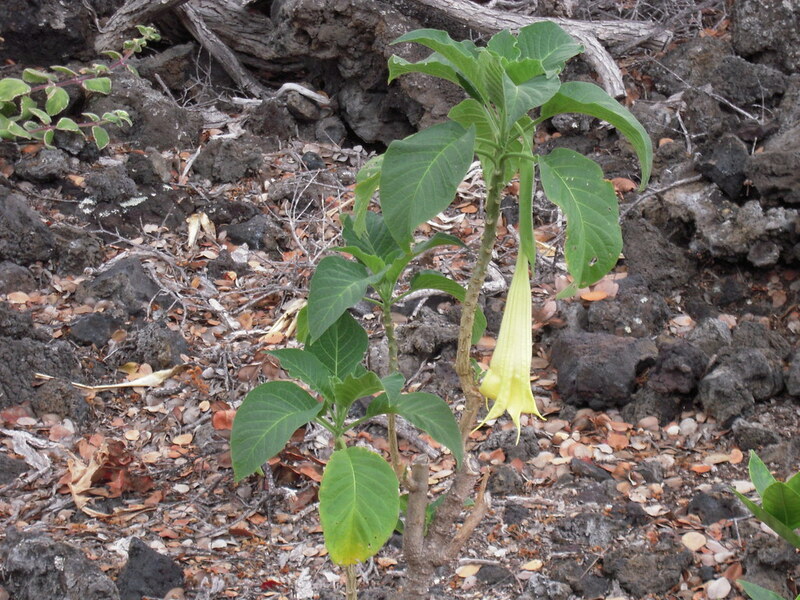 First, please realize that all parts of both Datura and Brugmansia are highly toxic. When you work with them, I recommend that you wear garden gloves and certainly don’t put your fingers on your face if you’ve touched them. One friend ended up having a difficult time breathing after she’d been trimming them. It has been used in shamanic rituals, as well as in a drink called “ayahuasca” in South America. 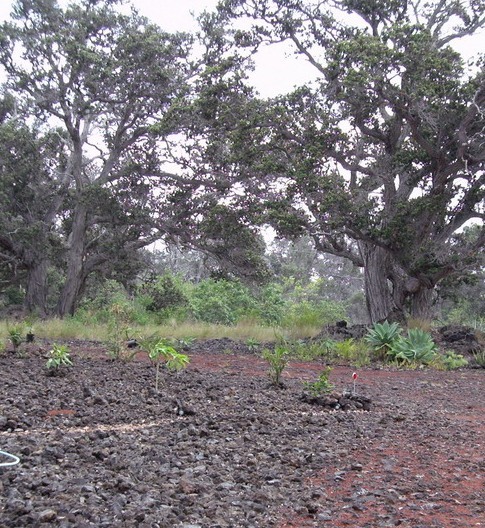 On the north end of the Big Island of Hawai`i, there is a group (they call themselves a “church”) that uses ayahuasca in their rituals. One of my students just gave a talk on ayahuasca this week in my class on substance abuse. I won’t go into it here, but please do the research if you are interested in finding out more. 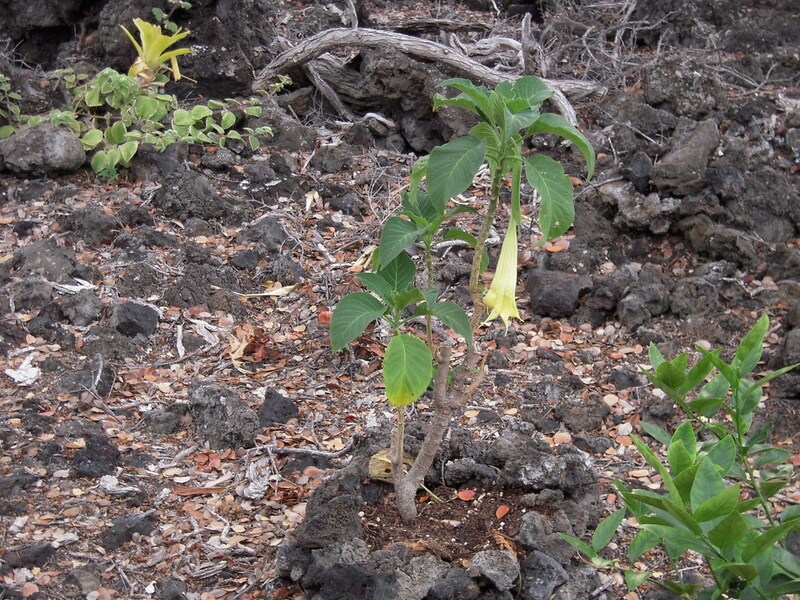 In my research, I also found a society dedicated to Datura and Brugmansia – the American Brugmansia & Datura Society, Inc. So evidently I am not the only who seems to think of them together. 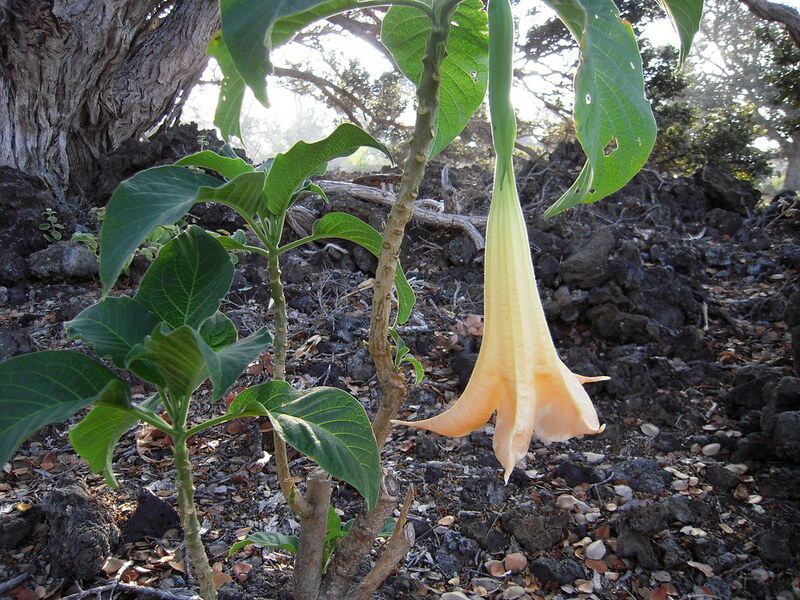 Another fascinating connection, at least for me, is that the Datura and Brugmansia belong to the perennial herbaceous family of Solanaceae – that includes Belladonna and other toxic plants. When I was a child and constantly suffering from asthma, the only remedy that seemed to work was Asthmador made of Belladonna . It came in cones of incense, powdered form, as well as cigarette form. When the first two could not be found, my father taught me how to smoke Asthmador cigarettes! Since then, at least one medical article has come out that talks about how a toxic psychosis could be induced by Asthma-Dor. (Can Med Assoc J. 1971 February 20; 104(4): 326) I also discovered an art site that showed a “vintage box” of Dr. R. Schiffman’s Asthmador cigarettes that was on auction. Although that drug is the only reason I am alive and breathing today, I hope I haven’t become too obsessed with learning more about the graceful and dramatic Brugmansia outside my door.